Summary: Many airlines now offer mobile boarding passes which enable you to check in using your phone - the challenge is whether you can invoke the relevant screen on your device as you're about to board the plane.Essentially the sequence of events is that once you check in online you can opt to send your boarding pass to your mobile device, which means getting an email link you open on it. Essentially the sequence of events is that once you check in online you can opt to send your boarding pass to your mobile device, which means getting an email link you open on it. 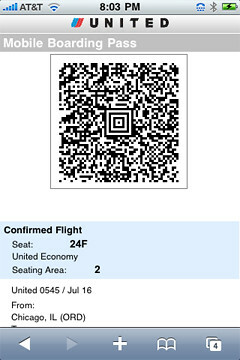 On an iphone you see a screen like the one here, in this case for a United Airlines flight. Comment from TravJouS: To make it easy for all World Travellers we have created the Check-In Companion. 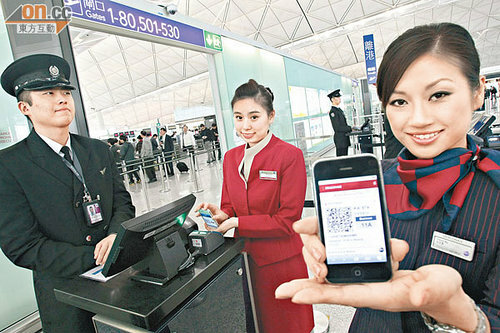 The App will store the boarding pass in your smart phone. If the Airline send the Boarding pass to you by email or SMS, then the above article helps you to store it easy on your smart phone.